If you want to migrate email for your google app users to Office 365, the users need to create an app password that you will use together with their google apps password to connect to their Gmail. 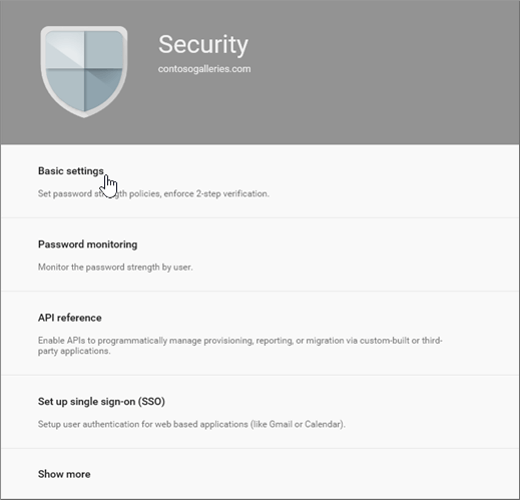 Before they can create an app password, you will have to allow them to turn on 2-step verification in the Google Admin console. In order for your users to create an app password, they will have to first enable 2-step verification. On the console choose Security. On the Security page, choose Basic settings. And then check the check-box next to Allow users to turn on 2-step verification. Your users can now turn on 2-step verification and create an app password as described here: Prepare your Gmail account for connecting to Outlook and Office 365.